In this blog post I will start to Create the schedule, and I will show you how can get in trouble when you do it. If you want to track this Blog post, and next few one, you should download my sample mpp file. I will give you a link at the end of this post. 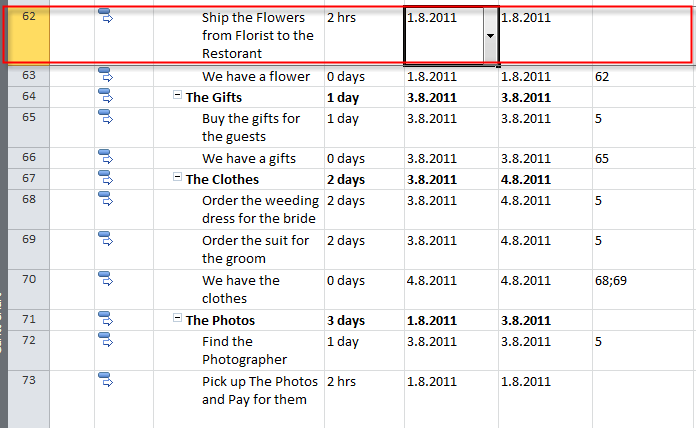 My first task is “Decide the Initially Budget and size and Style of the Wedding. Decide who pays for what”. After you know your budget You can determine your guest list! After that you can do the rest. 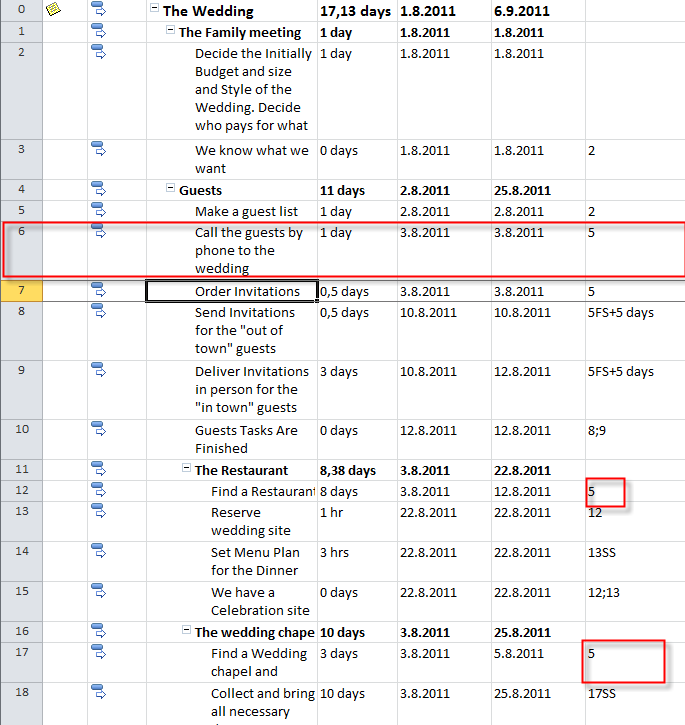 The first task in all Summary task can start when Task “Call the guests by phone to the wedding” is finished. Why? Well, simply because after that you know how many people will come to your wedding, and you have enough information about, for example, how big should Restaurant be, how many bottles of wine you have to order, how many rooms you must reserve for your “out of the town” guests, etc. Where is the Problem? 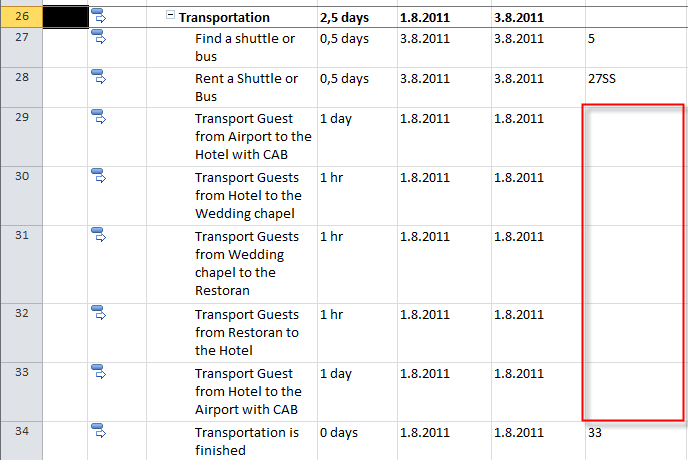 If you decide to put all those tasks (Find a Restaurant, Find a wedding chapel, Find a Hotel Near the Restaurant,….) immediately after the ““Call the guests by phone to the wedding” task, you should ask yourself: “There are so many tasks that will start at the same day (03.08.2011)! Who should do those task?” Suppose that the Bride and The Groom decide to do all those tasks by themselves. Is it possible to do all those task in few days? NO IT IS NOT! For now, I will leave this schedule as it is, and after I build the whole schedule, and when I put (assign) resources to all those Tasks, I will see the “Over allocation” and THEN I WILL FIX IT! 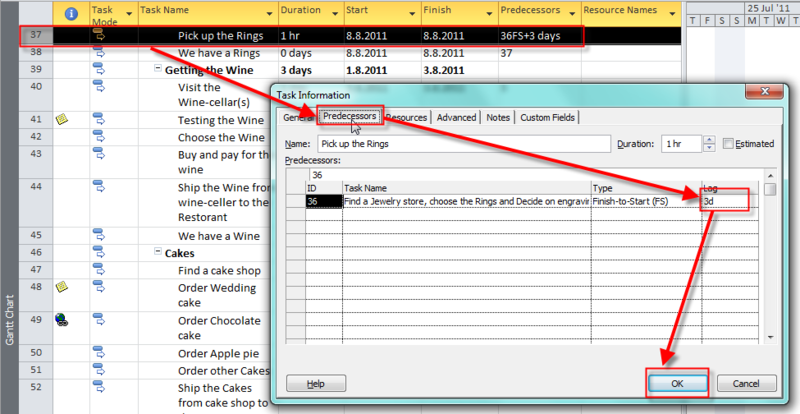 So, once again, I made those tasks wrong, by PURPOSE, just to show you in the future how can you correct wrong plan in MS PROJECT 2010. Another Problem is with the Rings. I forgot the Task: “Pick up the Rings”. After you find a jewelry, and you decide on engraving, the jeweler will need some time to make those rings (this is often situation in Croatia), and to engrave those Rings. Transportation! How long will take for the transportation tasks? It depends on the Location of the Hotel, wedding Chapel, and Airport? So I put 1 hour for now, but after I will know where those locations are, I will have to change those values. Another problem I With Predecessors! when do we have to make those transport? Well, to the hotel from the airport one day before the wedding. From the hotel to the wedding chapel, and then to the Restaurant at the day of the wedding. And then, after the wedding back to the hotel, and then they after the wedding, back to the airport. The “Wedding” Project isn’t so easy, after all, is it? I will continue with this subject in my next Post. Regards, and do not hesitate to give me any comment you want! This entry was posted in MICROSOFT PROJECT, Microsoft PRoject 2010, MS PROJECT 2010, PMI, PRoject Management and tagged MS PROJECT, ms project - scheduling, MS PROJECT 2010, PMI, Project Management, Project Management; Scheduling Tasks. Bookmark the permalink. This has been some of the most resourceful information I have found to date! Thanks so much for taking the time to out together your post.